Behind every successful MDM implementation lies a well-designed roadmap that lays out the steps needed to bridge the gap from ideation to execution. Yet many companies today don’t properly plan and budget for IT projects. In fact, poor budget planning is the reason why 75% of businesses anticipated their software projects would fail. This begs the question: how do you begin your MDM project? 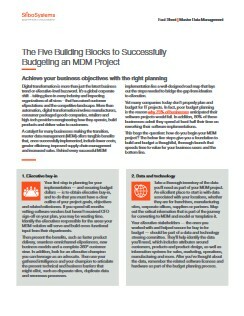 Download this fact sheet to learn about the foundation needed to build and budget a thoughtful and thorough launch for your MDM solution.